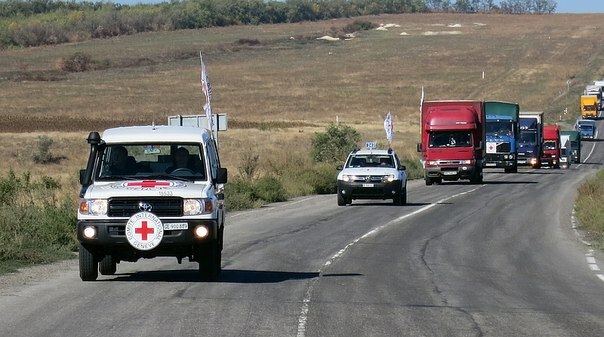 The trucks with humanitarian aid from International Committee of Red Cross (ICRC) were stopped by pro-Russian rebels in Donetsk Region on the territory which is not controlled by Ukrainian authorities. Yesterday 16 cargo trucks with humanitarian aid from ICRC passed by Ukrainian checkpoint “Bugas”. They were transporting 255 tons of food, construction materials and other things for people of Donetsk Region. But those trucks were stopped by illegal armed groups of so-called Donetsk People’s Republic on the territory which is not controlled by Ukrainian authorities, they refused the trucks to pass by saying that they didn’t have some documents. So about 250 tons of real humanitarian aid couldn’t be delivered to people who need it. UPDATE. Later today Jenny Tobias, spospokesperson for Europe & Central Asia at International Committee of the Red Cross, has confirmed that 16 trucks with humanitarian aid still can’t get to occupied territory.
.@LUGANSK_TODAY Correct that our 16-truck convoy wasn’t able to pass into opposition territory y’day despite discussions at last checkpoint.